Registration is now available for Western Mass. Blizzard 2019-2020 Tryouts. The Western Mass. 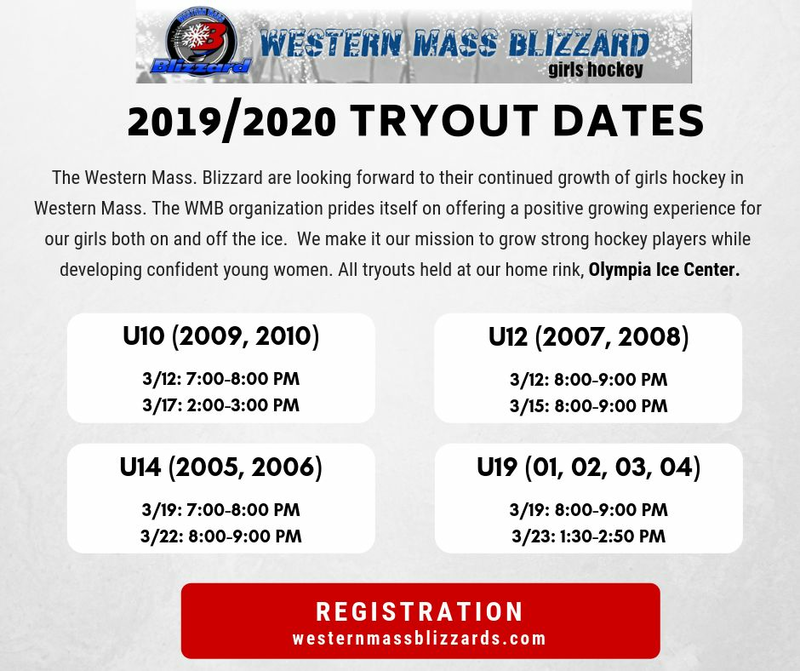 Blizzard are looking forward to their continued growth of girls hockey in Western Mass. The WMB organization prides itself on offering a positive growing experience for our girls both on and off the ice. We make it our mission to grow strong hockey players while developing confident young women. All tryouts will be held at our home rink, Olympia Ice Center and will cost just $40 with online registration. Come see what it's like to be a part of the Blizzard family! The Western Mass Blizzard free clinic series features UMass Women's Hockey Head Coach Bill Wright, former Amherst College Women's Hockey head coach Kay Cowperthwait, and the Western Mass. Blizzard coaching staff. Learn individual skill development including aspects of skating, edge control, balance and puck skills such as stick-handling, shooting & passing. The drills we perform are designed to teach proper technique with individual attention to detail for both experienced players and beginners.